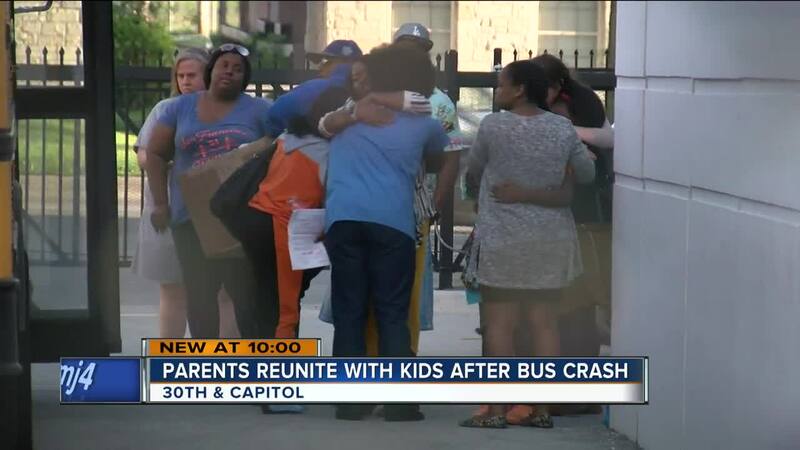 Parents reunited with their children at Hope Christian School Wednesday night after a school bus crash sent 20 of their classmates to the hospital. The accident happened in Columbia County near the Village of DeForest just after 10:00 a.m. Wednesday. The children were headed to an end of the year field trip in the Wisconsin Dells when the crash happened. A total of 33 people were on the bus. The students who were not injured were taken by bus back to the Hope Christian School Semper campus at 3040 N. Capitol Dr. to be picked up by their parents. "We just hope that she's ok," said Tasha Johnson, whose niece was one of the students taken to the hospital. Johnson says her sister rushed to Madison to be with her daughter. "She needed to go up there to see exactly how bad it was, make sure she was OK, cause she called her," said Johnson. Another parent said his son was one of the two students airlifted to the hospital after his son complained of stomach pain. He said his son ended up with a leg injury and is going to be OK. According to the Wisconsin State Patrol, the driver of the school bus pulled over onto the shoulder because of a mechanical issue. The semi-truck then rear-ended the bus. Four of the students received serious injuries. None of the injuries were considered life-threatening. This happened on the eve of a big day for the eighth-grade students, their graduation is scheduled for Thursday. "I hope she's not all banged up," said Johnson. The driver of the truck worked for Dahl Trucking. Ted Dahl, the owner of the company released a statement saying, "We're very sad that this happened. We pray for the families involved, and for the children to make quick recoveries." "While very scary, our staff and students were blessed by urgent first-responders, local medical attention as well as the kindness and generosity of Deforest Public Schools. Please keep our Semper scholars in your prayers for quick recovery and safe travels to reunite with loved ones."